Keep your throwing birds off the ground and free of pesky ants and other bugs while they're drying. Quality steel construction features folding legs and neck channels. Holds up to 30 birds and rotates 360 degrees. Stands up even on sandy soils. 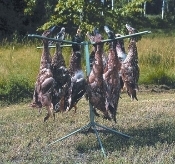 This folding metal bird dryer is preferred by leading professionals.